In a recent review, I discussed the film Dear Mr. Waterson. It was an overly sentimental look at one of our time’s most beloved comic strips Calvin and Hobbes. That film scratched the surface on the politics and cultural ecology surrounding the specific strip, allowing a number of people to relive their favorite iterations of the comic strip. In essence, it was one big “we love Calvin and Hobbes” tribute. While it was entertaining and nostalgic, it was a shame the movie didn’t delve deeper into the creative process and business model of the comic industry. At it’s best Dear Mr. Waterson was a fun little trip down memory lane; at it’s worst the film was a self serving parade for the director to talk about how he’s their biggest fan. 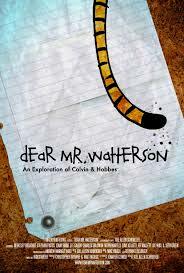 The title of that film centered around an unresponded letter to the creator of Calvin and Hobbes, Bill Watterson. In Stripped we get all the missing elements, as well as hear, for the first time for most of us, Bill Watterson as he talks about the industry that made his creations pop culture icons. Stripped is a documentary film that sets it’s lense squarely on the comic strip industry refuses to look at anything else. Directors David Kellett and Frederick Schroeder allow the giants of the comic strip world drive the narrative. Their examination is vast, touching on everything from the creative process to licensing of merchandise. The vast differences in philosophy between comic creators is staggering considering all their creations resided on the same page of a newspaper together. The crux of the movie is the divide amongst the newspaper comic creators and those thriving in the digital age. The real joy is simply in listening to people that are absolute giants of the industry discussing their work. Jim Davis (Creator of Garfield) and Bill Watterson were two of my highlights, but there are many, many more that offer their insights and experiences into the art and business model of the fantastic medium. Very early on there is an obvious divide between the older generation of artists and the newer. Having little knowledge of the inner workings, it’s absolutely fascinating to watch the two sides discuss why their particular business model is the best. We have artists vouching for syndication on one side, the idea that you sell your strip to a syndication and they sell it to individual newspapers. Then on the other side are the digital age artists that pay to host their own websites and sell their own merchandise swearing by their method. Despite differences all the creators featured in this film share a passion for their medium. They love it almost as a parent would love a child. They’re angry with it at times, tired of it. But it is what defines them, and the act of putting words and pictures together fuels them in a way that allows for a perfectly paced documentary film. 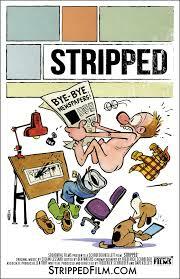 Stripped would be a fun watch for anyone, even more so for someone that grew up loving the funny pages. Among the interviews is the first ever recorded interview with Bill Watterson, which is itself worth the run-time of the film. The pacing is perfect with a score that is neither distracting nor boring. Ideas and ideologies are bounced off the viewers all while the evolution and history of a beloved medium draws itself onto the screen. It is not, however a story with an end. Comics, despite what some might say, are not dying. This is a time of transitioning and change. A time of uncertainty, but one of hope. This is the message of Stripped. A message that may or may not be true, but one that immensely interesting to hear. Art is a universal concept for expressing an innumerable amount of ideas. The mediums by which art is expressed are as far ranging as the imagination. Some are held in high esteem and others are only considered art by those that practice their particular medium. There is one form of art, that is cheap, inexpensive and loved by millions. Cartoons, referring to drawn comic strips that use a limited number of panels or space to connect a string of thoughts or a singular idea using a mixture of still images and text, has captured the attention of the world throughout generations. Bill Watterson gave us one of the best comic strips of all time with Calvin and Hobbes. The strip, for the two of you that aren’t familiar with it, follows the adventures of an overly imaginative six year old named Calvin and his pet Tiger named Hobbes. They embark on philosophical and imagination fueled treks across universes while rarely leaving their neighborhood. In the film Dear Mr. Watterson new filmmaker Joel Allen Schroeder uses interviews and nostalgia to fuel his own adventure; one that seeks to summarize the emotions surrounding this iconic comic. Funded on Kickstarter Dear Mr. Watterson is a documentary in which Joel Allen Schroeder interviews Comic strip artists, fans and historians. He respects Bill Watterson’s thirst for privacy by not attempting to interview him, but digs into the mania surrounding Calvin and Hobbes. The documentary is served up in a number of segments ranging from topics about licensing and copywrite all the way to the decaying nature of the newspaper comic page. Mr. Watterson’s reclusive nature is absolutely evident throughout the film, and is noted by almost everyone that is interviewed. We’re introduced to a person with a rich philosophy on art and human nature, but he only speaks through his creation. We are served a tiny glimpse into a vast and interesting world, one that in some aspects is dying with the newspaper business and in others is striving in the digital age. The movie itself is propelled primarily by a strong sense of nostalgia. Too much of the content was a nudge to audiences that sought to say “remember how good that one strip was?” when it could have been spent divulging further information on both the industry and the history surrounding comics and Calvin and Hobbes in general. It’s a phenomenal strip, to be certain, but we all know that and as fun as it is to see someone reminisce about cutting out sunday papers and tacking them to their wall, a documentary should be first and foremost informative, otherwise I would much rather simply discuss the comics with people that I know. That isn’t to say that the film completely squanders it’s opportunity; far from it. Though the transitions from segment to segment are largely self serving to Schroeder, he certainly includes some interview gems. In particular the ones that speak to the climate surrounding the comic industry shortly before Watterson retired. While perhaps relying too heavily on nostalgia, Dear Mr. Watterson manages to take a beloved piece of art and puts it under a lens that allows us to view it more in depth than we might have otherwise done. Calvin and Hobbes is universally loved, and Schroeder does his best to let you know that he loves it just as much as the best of them. We’re given a rare glimpse into the mindset of cartoonists, and allowed to hear from those that worked right alongside one of the greatest comic artists of all time.